Question: Hi, I am interested in building this duplex with SIPs. They are 6.5" thick, or same as 2X6 construction. How much to draw this plan with SIPs? Also, when you order 8 sets of plans, do they come to you on 24"X36" full size paper in a tube? What if I need more sets or want to email the plan to trades to quote on, what do you recommend I do? We would build this with a crawl space. Also it says roof is 45 psf, We require higher roof load, our roof truss supplier will do that for us unless you have other suggestions? Thanks. Answer: 1. 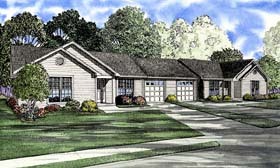 Hi, I am interested in building this duplex with SIPs. They are 6.5" thick, or same as 2X6 construction. How much to draw this plan with SIPs? Answer: We can convert to 2x6 for a $250 fee. 2. Also, when you order 8 sets of plans, do they come to you on 24"X36" full size paper in a tube? Answer: Yes. 3. What if I need more sets or want to email the plan to trades to quote on, what do you recommend I do? Answer: You may order more sets for an additional fee or order the PDF files which will allow you to print locally as needed. We would build this with a crawl space. 4. Also it says roof is 45 psf, We require higher roof load, our roof truss supplier will do that for us unless you have other suggestions? Answer: The truss company is the best resource for this.